Friday, May 2 at 7:00 p.m.
Hitchcock famously said “Some films are slices of life; mine are slices of cake.” His career spanned forty years and many film eras. Film expert Rick Winston will discuss the evolution of Hitchcock’s craft, exploring his favorite themes, his relationship with his collaborators, and his wry sense of humour no matter how grisly the subject matter. By drawing on twelve film clips, starting with his 1925 silent The Lodger and continuing through to his Hollywood classics such as Notorious and Rear Window, Winston will illuminate the arc of Hitchcock’s brilliant career. Free, accessible to people with disabilities, and open to the public. Contact Sharon Crossman at (802) 824-6246 for more information. 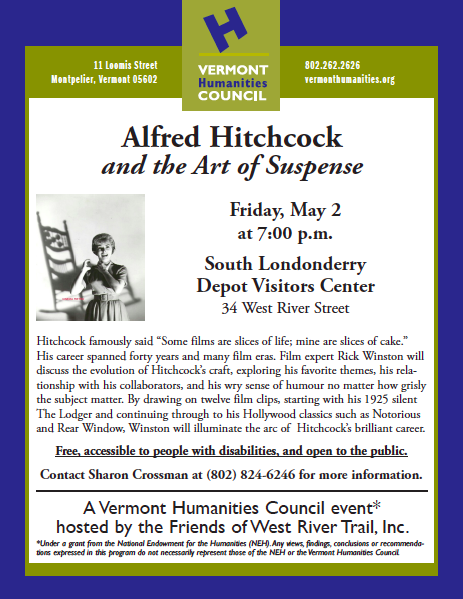 A Vermont Humanities Council event hosted by the Friends of West River Trail. This entry was posted in upper section and tagged alfred hitchcock, friends of the west river trail, Rick Winston, south londonderry depot, upper section, vermont humanities council. Bookmark the permalink.